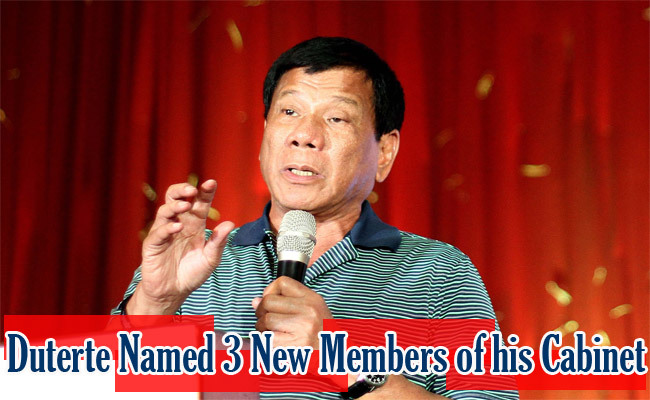 Less than two weeks before president-elect Rodrigo Duterte’s inauguration, he announced last June 13 through a video clip with the media at Davao City the 3 new members of his cabinet. Incoming presidential spokesperson, Ernie Abella, revealed that Duterte had chosen secretaries for the last 3 remaining departments. They were Dr. Paulyn Jean Rosell-Ubial for Department of Health (DOH), Wanda Corazon Teo for Department of Tourism (DOT), and lastly Ramon Lopez who will handle the Department of Trade and Industry (DTI). Ubial is currently the assistant secretary for the office at regulations at DOH. Teo on the other hand is an owner of the Mt. Apo travel and tours where its name came from the country’s highest mountain located at Davao City. Aside from that, he also leads the National Association of Independent Travel Agencies where is the president. Meanwhile, Lopez is the Vice President and a corporate planning head of RFM Corporation which is one of the country’s biggest beverage and Food Company. He is also the executive director of Go Negosyo, an advocacy group that helps Filipino entrepreneurs. Christopher Go, an executive assistant of Duterte also confirmed the newly appointed secretaries of each department. He also revealed that our incoming president’s spokesperson is a Christian pastor. He was then asked if Duterte already picked a new Chairperson for Commission on Higher Education (CHED) but he replied it will still be retain by Patricia Licuanan for it’s a fixed term. Last June 3, Duterte first revealed his incoming 23 cabinet secretaries and officials who will handle various agencies and bureaus through a presscon on his residence at Davao City. The president elect’s cabinet is a combination of military officers, retired policemen, former government officials, and his former classmates. His reason for choosing them is because he can trust them and they have integrity.